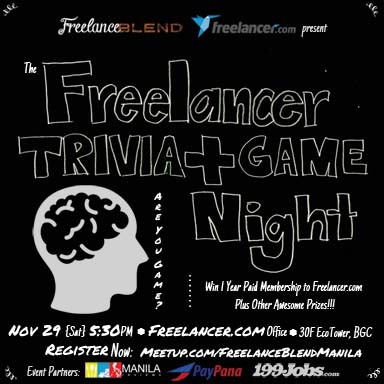 That’s why I am happy to invite everyone to Freelance Blend and Freelancer.com’s “Freelancer Trivia + Game Night”on Saturday, November 29, 2014 starting at 5:30pm at the Freelancer.com Philippines headquarters — 30th Floor, Ecotower, 32nd Street corner 9th Avenue, BGC, Taguig. This meetup will also serve as a late celebration of sorts of Freelance Blend Manila Meetup Group’s 1st year anniversary (yey!) as well as an advance gathering for the coming Yuletide season. Are you ready to put your GAME ON as we battle in groups against our fellow freelancers in Trivial Pursuit, Charades and Parlor games? We will also be giving away cool and exciting prizes such as five (5) basic membership packages to Freelancer.com for one year (value of about P2,700 each) and a lot more! 6:15 pm – Short talk by Jojy Azurin and Evan Tan of Freelancer.com. Merry Christmas and we hope to see you all there!